Are you one of those million people who still don't have any girlfriend? Well I also comes under the same category just because I love my computer. But good news is, now you can be in relationship with your computer and hopefully it should be of opposite gender (LOL). 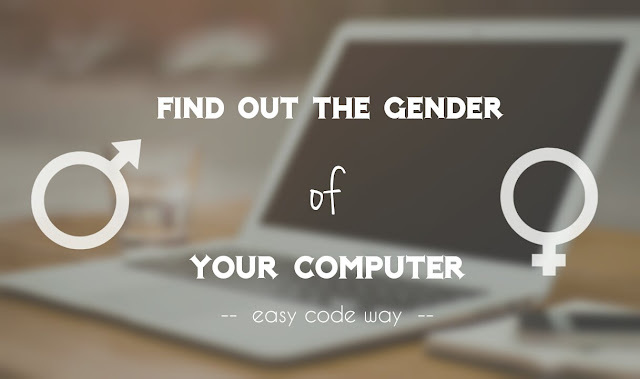 This can be checked with the help of a simple Windows trick which let you find out the gender of your computer or laptop. This tutorial will guide you how to do that. We will be using a VBScript program for this trick. So before moving to the steps first let me introduce you with this new term. VBScript is an active scripting language developed by Microsoft. The full form of VBScript is Visual Basic Scripting. It is designed as a lightweight language with a fast interpreter used in a wide variety of Microsoft environments. 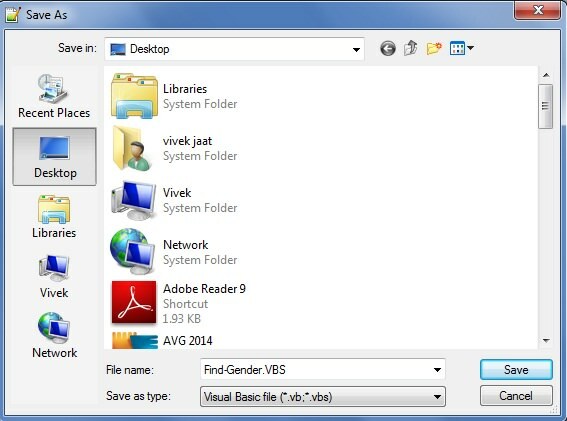 The basic and the most common file type extension for VBScript program is ".vbs". This can be easily programmed in Notepad. Now copy paste or type this code inside it. To save it, click on "File > Save As" option. Alternatively, you can use "CTRL+S" keyboard shortcut key. Now choose the location where you want to save this program (say I choose Desktop) and type its file name. For example, "Find-Gender.vbs". Make sure to type ".vbs" after file name. As already mentioned, it is the file format of VBScript programs and without it, your program will not work. Now go back to the location where you've saved the program and open it. It will ask you to type any words. Type anything meaningful and readable or simply say "I love you". Now press OK button and see the magic. Cross check the code again. Turn on or Increase your computer volume. In above program, you've to type the text at the time when you'll execute it. Apart from this, you can manually add the text in code. To do this, right-click on program and click "Edit" option. Now replace the previous code with this one and save changes by clicking "CTRL+S" shortcut key. CreateObject("sapi.spvoice").Speak"I love you but as a friend, LOL"
This new program will automatically speak the text without displaying any window. You can change the text between quotes with your own words. This program can also be used as a Text to Speech tool. Simply type or copy paste the text inside it, sit back to your chair and listen. Imagine how it would be when you'll open your computer and it will welcome you. Sounds good? Hm. I had already talked about this trick in my previous article. All what you need to do is to copy this program in startup folder. Now let me tell you the basic logic behind this tricks. Anything saved inside startup folder will be executed each time when you'll open your computer (and even without asking for permission). In the same way, If you'll copy this program in same folder, it will start automatically and welcome you. You can find your computer username by executing "echo %username%" code in command prompt. When everything is done, restart your computer and see how it will welcome you. If you're facing any problem, fell free to ask me in comment box. Stay tuned for more interesting tutorials. That is so sweet. Wish you all the best for your upcoming journey. My sister was also having the same journey. She had used select baby gender introduction to select the gender of the baby. That was really effective and did not cost that much.